Great British Bike Rides is a celebration of British road cycling. Dave Barter brings together 40 of the best road rides in England, Scotland and Wales, searching out the country’s most celebrated routes, toughest climbs and most scenic roads. 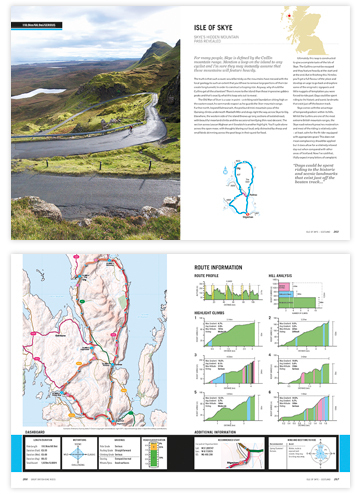 The rides are challenging, they are adventurous, and they are quintessentially British – tackle the gradients of the classic Fred Whitton in the English Lake District; pit yourself against fearsome climbs inspired by the Dragon Ride in Wales; and feast upon Scotland's stunning scenery following wild roads through Assynt and across Skye. Already a fanatical cyclist, Dave packed in his job and hit the road, embarking on a 9000-mile tour of Britain to bring together the best riding the country has to offer. His cycle routes are devised specifically for this book, enchaining unforgettable climbs, quiet roads and stunning scenery. Each ride is accompanied by detailed route information, bespoke mapping and a statistical breakdown including every detail the committed cyclist requires. The book is complemented with a set of downloadable GPX files to further aid navigation. Join the cycling revolution and discover the best road cycling in Great Britain.